The Communist Party of Israel (CPI) and Hadash (The Democratic Front for Peace and Equality) forcefully and unequivocally condemn the recent statement of US President Donald Trump concerning Jerusalem, a statement, which entirely ignores the rights of the Palestinian people to and in that city. Trump’s statement is the result of the unholy tripartite alliance between the US administration, the Israeli government, and the reactionary Arab regimes and their escalating conspiracies against the just rights of the Arab Palestinian people – most prominently their right to self-determination in an independent state with East Jerusalem as its capital, consistent with UN resolutions. The positions of this alliance have never been clearer or more flagrantly blatant than now, both in the context of the Palestinian question as well as for the overall developments in the region. Trump’s statement only proves what we have been saying all along: The US is part of the problem rather than the solution to the conflict between Israel and Palestine. To ameliorate this dire situation, the door must now be opened wide for the international community to play a key role by promoting a political process based on the UN resolutions adopted by most countries and the overwhelming majority of peoples around the world. 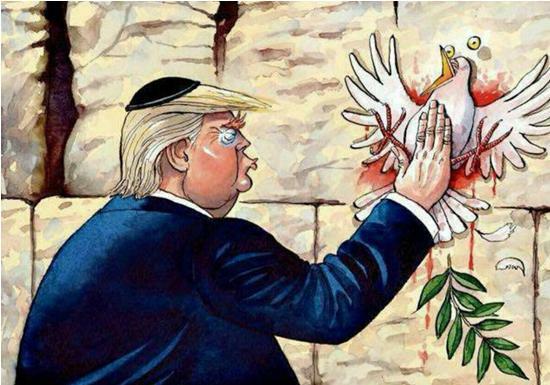 Trump’s statement in reality has no practical purpose aside from concealing the internal and external crises of imperialism, Zionism and the reactionary Arab regimes – and the failure of their plans for the region. Added to these, of course, is Netanyahu’s urgent need to distract the attention of the Israeli public from the ongoing corruption investigations against him. The populist accord with which so-called “opposition” forces in Israel have responded to Trump’s and Netanyahu’s joint adventure reflects, in fact, the political bankruptcy of the Zionist opposition and its inability to offer a genuine alternative to the occupation and the policy of settlements, and demonstrates their utter rejection of a just peace. Now is the time to raise the voice of protest around the world, against those policies and their leaders, including the voice of the true forces of peace inside Israel. CPI and Hadash call upon all anti-occupation forces, Arabs and Jews, to cooperate in promoting the only solution that can defend the rights and blood of both peoples: Ending the occupation and the establishment of an independent Palestinian state based on the borders of 4 June 1967 with East Jerusalem as its capital, alongside Israel, the capital of which is West Jerusalem.